The tool belt, also called the tool bag, nail bag, or tool pouch, comes in many variations. There are the kind that have the bags sewn into the belt; the kind that have suspenders; and the kind that you can design yourself - basically, you buy a belt and customize it with the bags that you need (my preference). The belt I use is an adjustable nylon quick-release type. I like it because you can adjust it once, when you first put it on, and then all you have to do is snap it together when you are ready to work. I bought the bag shown in the picture (above) because it suits my needs. You might choose a variety of other options depending on the type of work you do. My belt is similar to the one shown below. There are different types, like leather, for instance, if you don't like nylon. Once you have your belt, you can select a bag or combination of bags to add to it. 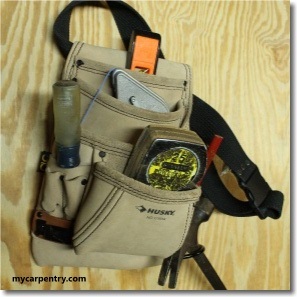 I used to have two bags on my tool belt, similar to the ones shown below, because I was working on a project that required carrying lots of nails. Later, I removed the nail bag because I didn't need it. I can always add it back on at any time. The sewn-in design includes several different sized pouches to hold your tape measure, hammer, speed square, and pencil, with pockets left over to hold different sized nails, etc. This was the design of my first nail bag. They have come a long way since the one I owned. Although I did not own one exactly like the one below, it seems like a good quality belt. I recommend visiting a hardware store that sells a good selection of tool bags and try a few of them out. The suspender type of belt is one that I have never owned, but have know many carpenters that swear by them. I can image that if you carry a heavy load of hand tools, or nails, this is the kind of tool belt you should consider. The suspender type of nail bag takes the weight off of your hips and waste by distributing it to your shoulders. Here is another suspender type of belt. If you are a roofer, for instance, you might prefer a tool bag that has a large pocket for holding lots of roofing nails. You may also want to slide on a separate hammer holder or a holder for your tape measure, or even another similar bag, so that you have one on each side. The belt-with-separate pouches might be a good choice. If you will be wearing your tool bag all day, or you will be carrying a heavy weight of tools/fasteners, the suspender styles that distribute the weight from your waste to your shoulders would probably be a good choice. If you aren't sure what belt will work best for you, starting out with the sewn-in type would be a good choice. They tend to be less expensive and contain all of the pouches you need to store tools and nails for most carpentry purposes. If you have some thoughts on nail bags that you would like to share, please feel free to contact us.